This blog is outstanding with the professional photos from all over Paris and the information connected to those. The author walks you thru Paris with warmth and detailed information, pin pointing interesting and not so well knowned spots in Paris and her favourite restaurants, bars, cafÃ©s, boulangeries, shops etc. Also you can tell she really loves the city. It shows in her writing and in her pictures. No one does it like her. Beautiful, beutiful!! Lovely pictures, lovely inspiration. Attractive, interesting and motivating. Just worth it all. Just beautiful and it makes you want to book a ticket to Paris right away! Lovely blog to read, beautiful photos to dream away...Ã‰very day I am looking forward to read her blog! Wonderful pictures and a good eye for details. Nice site reminds me my stay there. I just love her pictures and her ability to describe Paris this way! I fell in love with Paris two years ago. Because I don't live there and I can't visit it every weekend I stop by Paris in four Months every time Carin posts something. When a trip is on my agenda I always make sure to look at her latest tips to make sure I don't miss anything. I follow the blog via Bloglovin', because her stories, photo's and reviews always put a smile on my face. If her love for the city and her readers doesn't show with her latest idea, to move for far longer than four months, it shows through her lovely blog. 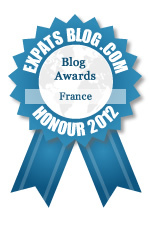 Best blog about Paris period. Carin takes stunning photos and those combined with her cute, personal writing along with giving us access to cool hidden spots and restaurants in Paris makes this a clear winner for me. Absolutely wonderful blog! I plan on traveling to Paris this coming summer, and Carin's photos and words about the city serve as an amazing reference for what to do and where to go. I feel like I'm actually there when I'm lost in Carin's posts. Paris in Four Months is beautifully curated and incredibly well-written, and it is deservedly one of my top reads. I absolutely love this blog! Every since I discovered it earlier this year, I consistently check it every single day. The pictures are fantastic and are often accompanied by great posts as well! I can honestly say this is one of my favourite blogs!!! I love this blog; beautiful photos that really showcase Paris, and just make you smile. I look forward to reading it everyday. Paris is so beautiful. Through her eyes and camera, it's even more beautiful. She has unique and sophisticated approach. I love her pictures and I can feel atmosphere captured on those pictures,divinely. Paris is one of my favotie cities and I feel that I get to travel there daily with Paris in Four Months. It's got such a simple style, focusing on moments in an amazing city. I love that the commentary isn't "in your face"...we get Carin's thoughts but the focus is always the photograph and what we take away from it. I check the site daily and am so happy that it is constantly being updated so that I can escape for a few minutes. This blog should win hands down! The best blog about the life in Paris. The photos are just drop dead gorgeous, reflecting the spirit of Paris! The most stunning Paris shots I*ve ever seen! Love everything about this blog! Keep on going, Carin! I love Paris in Four Months and visit nearly everyday to check for updates. It's one of the most beautiful blogs I've ever come across. Carin has such wonderful photos and they really make me want to visit Paris. Best Paris blog ever! Beautiful scenery and photography, great tips to the best spots around the culinary city and a fantastic glimpse on how it is to actually live the parisian life. An indesputable winner in my eyes. Hands down this blog is THE Winner! This blog is amazing. The visuals are stunning and the captions invoke the Parisian atmosphere. This blog is enjoyable to a wide variety of individuals from the novice who has not been to Paris (yet) to the seasoned Parisian traveler who enjoys reminiscing about Paris. Stunning Paris shots! I LOVE this blog! This blog is fantastic! It makes me want to go there right away. All the lovely photos and the very interesting information that you normally wont read about. I love it! Ive only ever spent a weekend in Paris, and 24 hours a couple of years ago - but endless hours through books and films. And now, I can travel there quicker than the speed of light through this lovely, luscious liasion between lively pictures and luring words. Love the blog! Very nice and very artistic too! Love all the details from this most beautiful city! Best blog about Paris ever!!! amazing photo's and inspiration to discover details in a city. also great for day dreaming about paris . I love her blog. It is beautiful, informational, and heartfelt. Designed in such a simple manner that you can check in every day and be truly inspired to find your own hearts desire! I adore this blog about Paris. Her photos and stories about life in Paris make me want to move there too. Best blog ever it gives an amazing view of what Paris is really like. She's doing an amazing job and should win this award!!! !